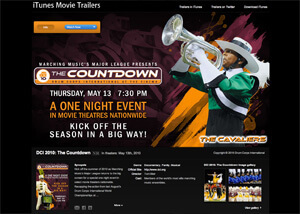 Hey drum corps fans: You can now watch the brand new trailer for DCI's spring cinema event, The Countdown, in the iTunes Movie Trailers section on Apple.com! A presentation of Drum Corps International and National Cinemedia's Fathom Events, The Countdown will be coming to more than 475 movie theaters nationwide on Thursday, May 13, at 7:30 p.m. local time. Recapping the action from last August's Drum Corps International World Championships at Lucas Oil Stadium in Indianapolis, this big screen event will feature the top performances of the world's most elite marching music ensembles in an unprecedented display of sight, sound and athleticism. Fans will also be able to check out behind-the-scenes reports straight from the rehearsal camps of this year's competing groups, classic moments from the DCI archives, and more! Check it out at trailers.apple.com.